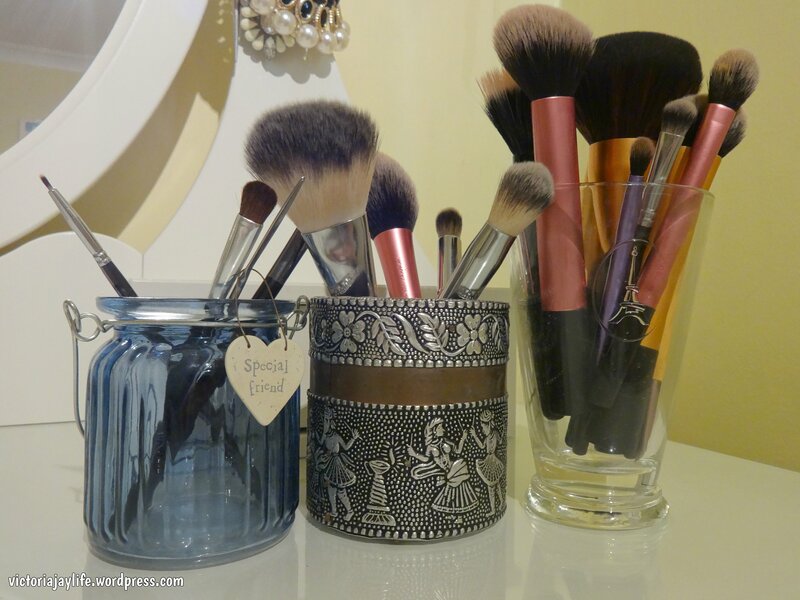 As I use make up brushes almost every day, I definitely want these in easy reach. I find you really don’t have to spend much on containers if you are willing to be creative and shop around. I personally like the mis-matched looked as you can see! The little blue container is actually a tealight holder from Wilko’s costing £2. 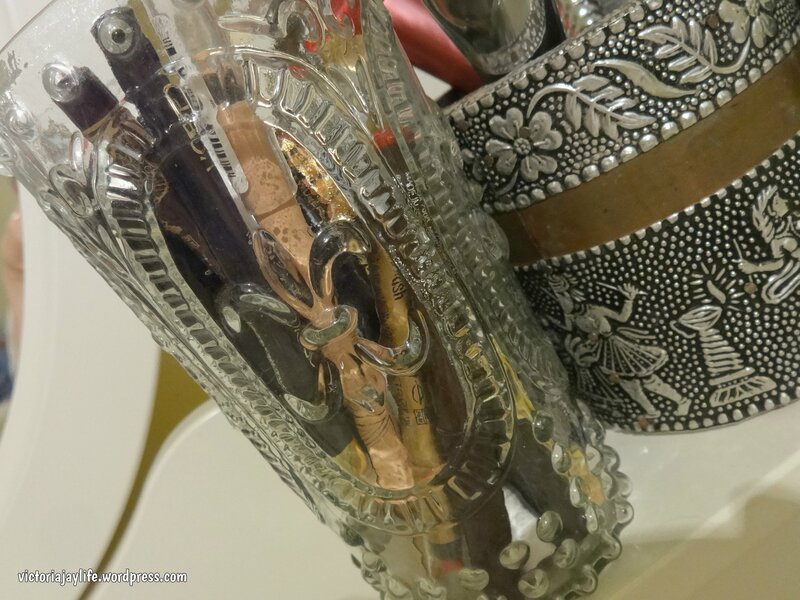 The middle container is a treasured gift from a friend from one of her trips to India and the Paris glass was another bargain from the TK Maxx kitchen section (I think it’s supposed to be a Latte glass!). 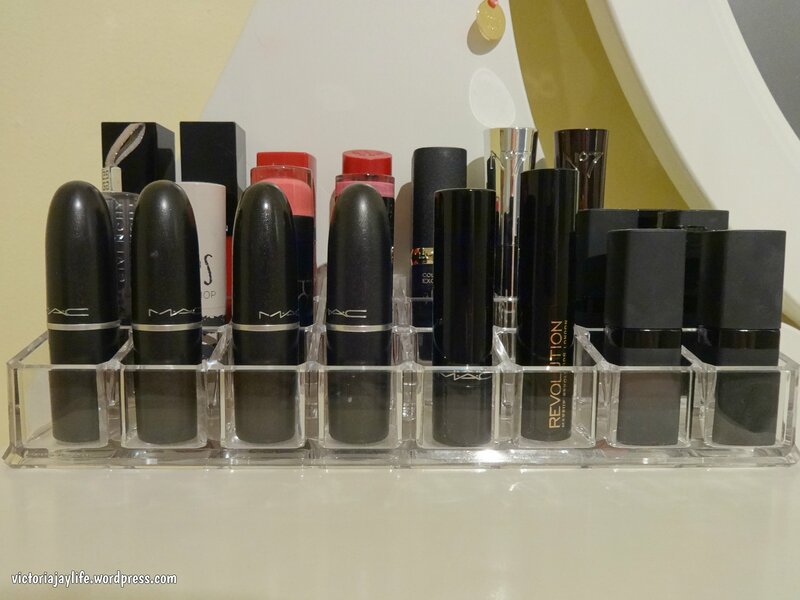 I keep all my lip liners and eye liners in the final glass, which was a Next sale purchase. 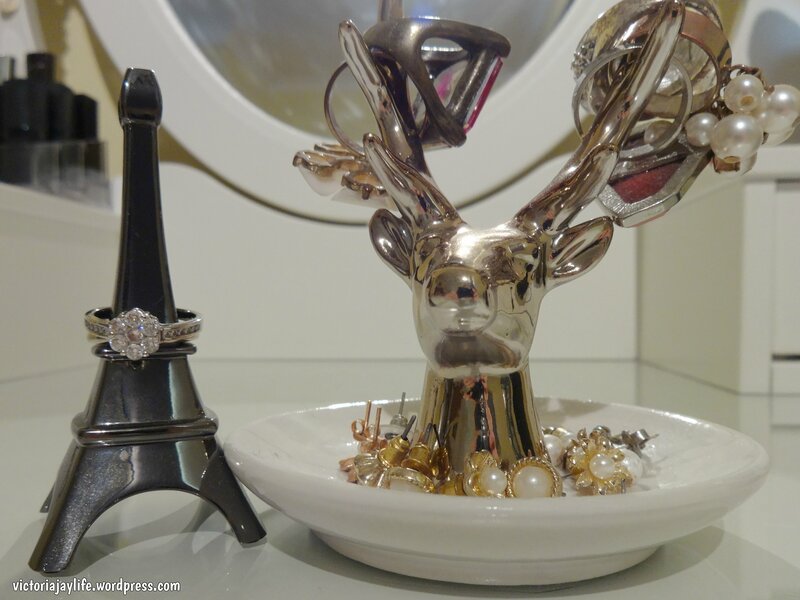 I love jewellery holders and want to get more, in all different shapes, sizes and finishes to continue with my mis-matched look! 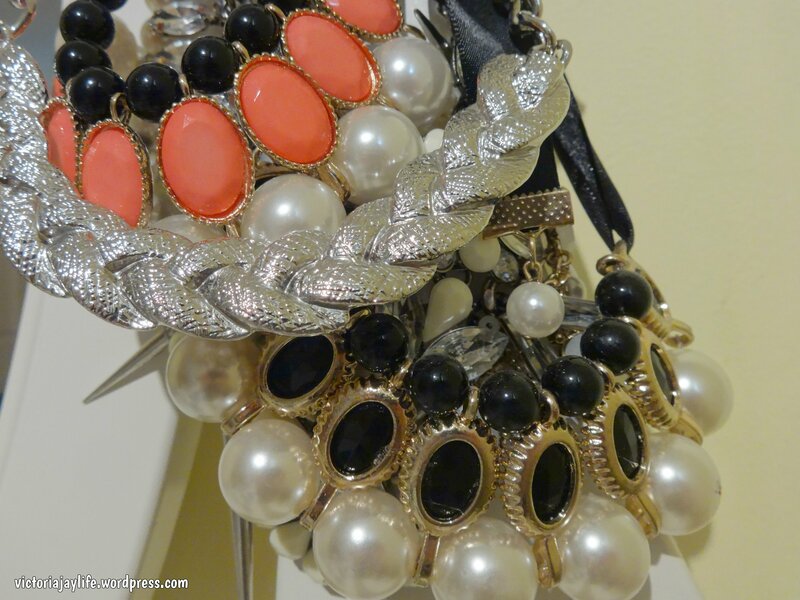 They are also a must for people prone to losing their jewellery, when you have items you wear every day but take off at night (speaking from experience!) I happened to get these both for Christmas last year. The Eiffel Tower one is from Next and was a gift from my husband. Here is were you will find my engagement and wedding rings (unless I’m wearing them). I keep all my ‘costume’ rings and stud earrings on the stag holder, a present from my sister-in-law and from Urban Outfitters. Finally; my perfumes. I’ve explained in a video on my You Tube channel that I’ve never been one to have a large perfume collection. I often only have one on the go and rarely have more than two. I’m also a bit of a fragrance floozy as I flit between many different scents and brands. 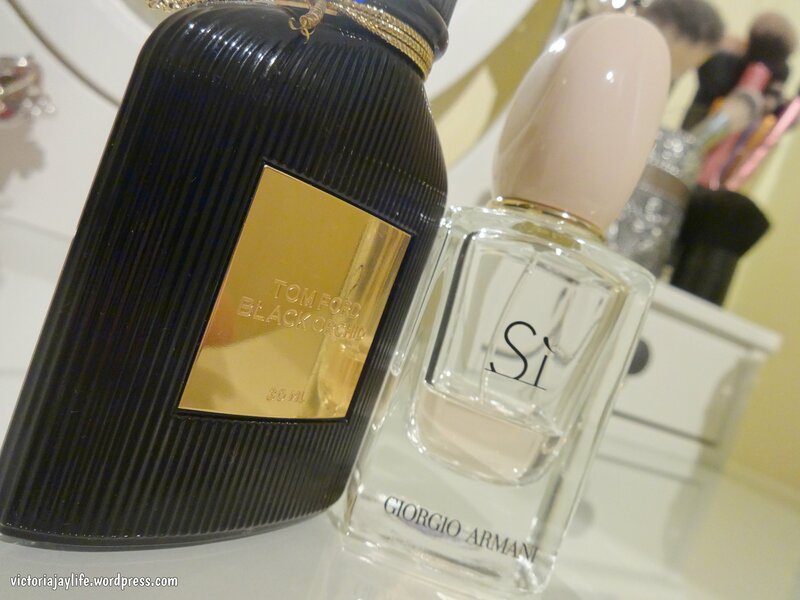 On the go at the moment are Black Orchid from Tom Ford and Si from Giorgio Armani. The Tom Ford fragrance is a rare repurchase so that speaks volumes. It’s a very heavy scent so I tend to reserve this for nights out in the Autumn/Winter but it’s so sophisticated and one spritz lasts a long time. It contains black truffle, ylang, bergamot and blackcurrant so is not at all floral (as the name suggests) and a really luxurious smelling fragrance (although this is definitely reflected in the price). Si is my more ‘every day’ scent at the moment. Fresh, girly and a little floral it has ingredients including blackcurrant, musk and rose. 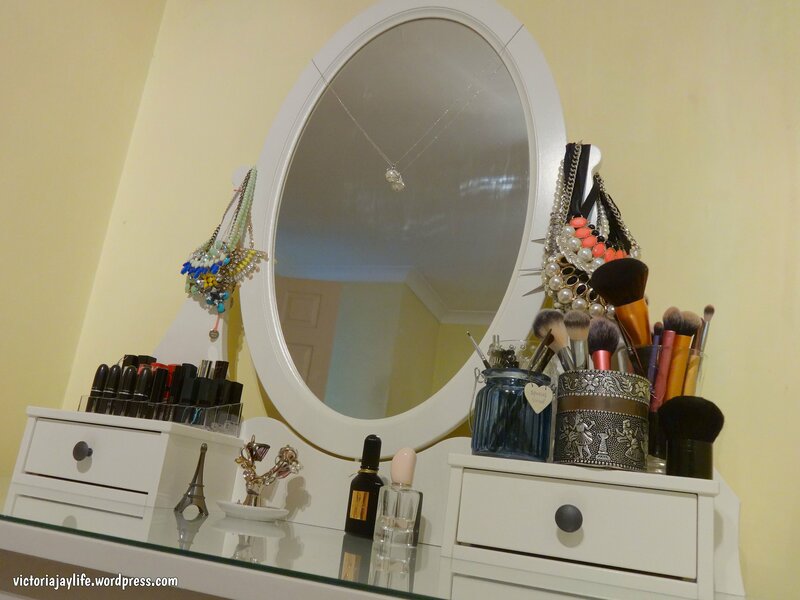 I hope you’ve enjoyed a tour of my dressing table. I plan to do a full make up collection video on my You Tube channel in the future so keep your eyes peeled! 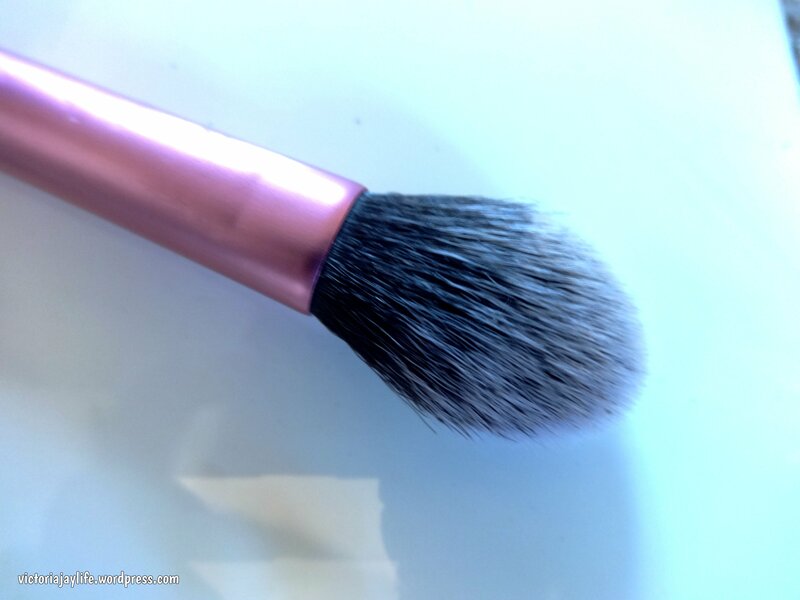 This is my favourite brush, from any brand, for applying foundation be it liquid or powder. 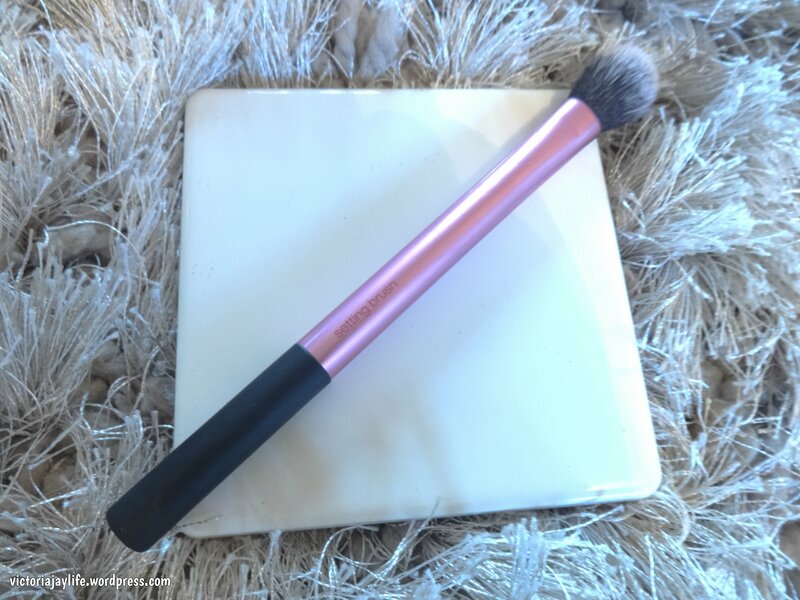 For liquid I dot the product all over my face and blend it in with the brush. 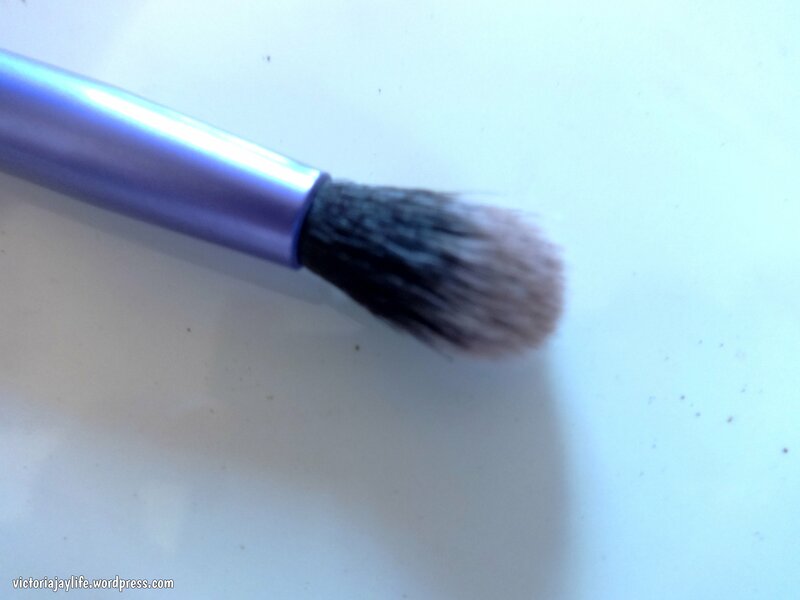 For powder I give the brush a swirl in the product before applying it. 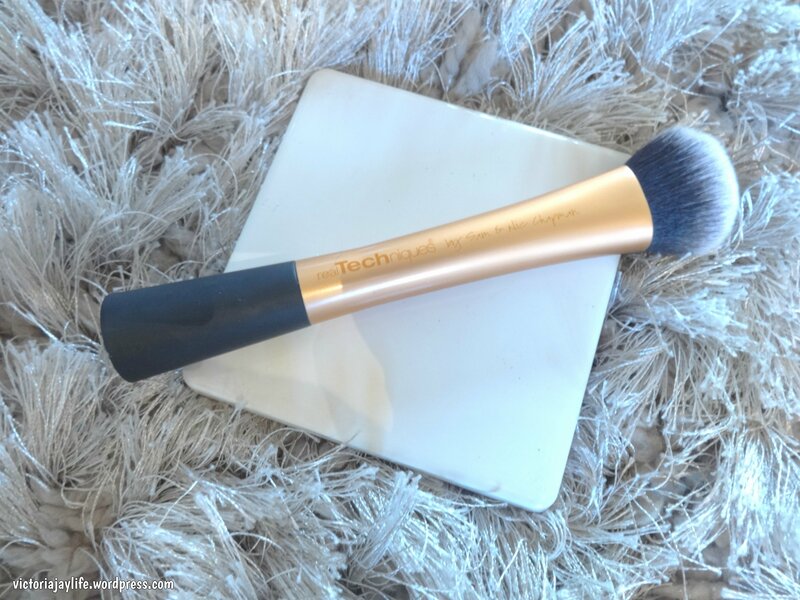 It gives a beautiful smooth finish and is just the right size to apply a full face pretty quickly but the shape still means you can still get the product in all the contours of your face. It’s a dense brush, so washes really well and think it looks as good as new, despite being over a year old. 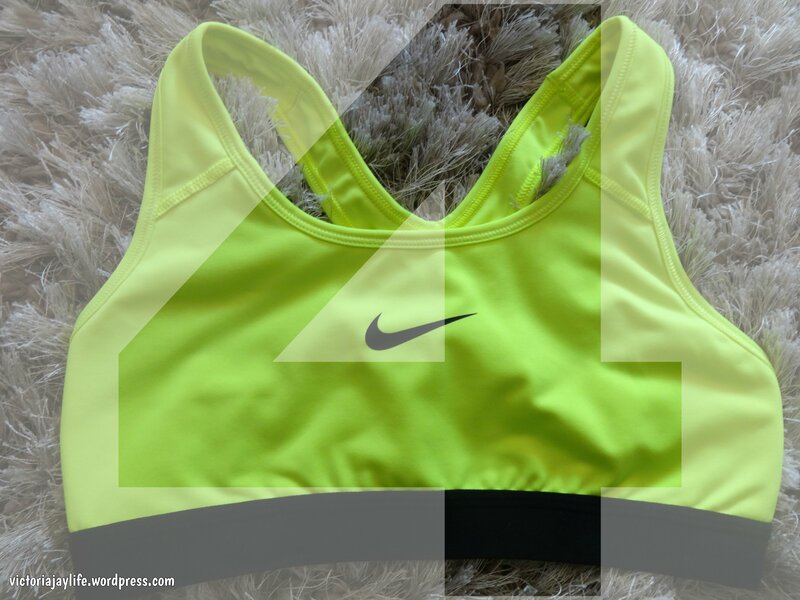 A must have in my opinion! The only potential down side to this brush it that you can’t buy it individually so have to fork out for the set. However you do get four other eye brushes and I would say it’s well worth getting when this gem is included! 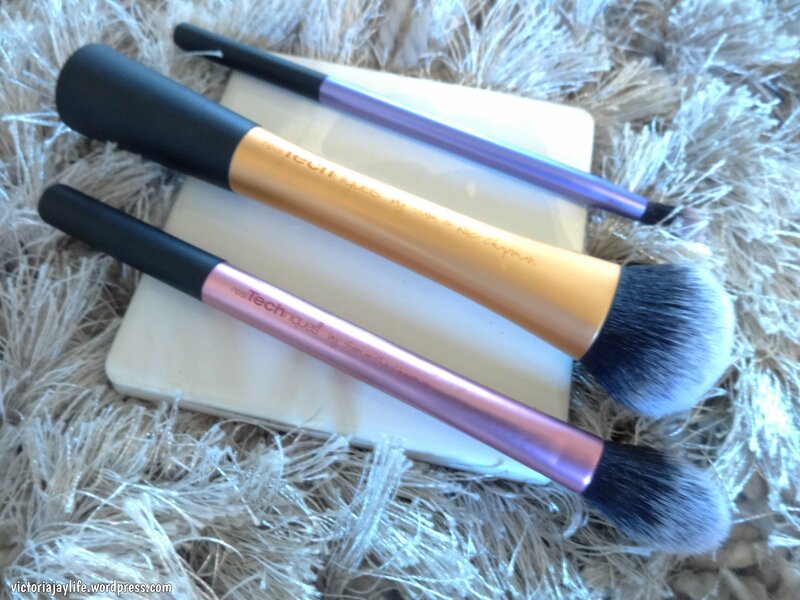 The slim handle with good grip, and soft domed head of the brush make this amazing for crease colours in the eye. 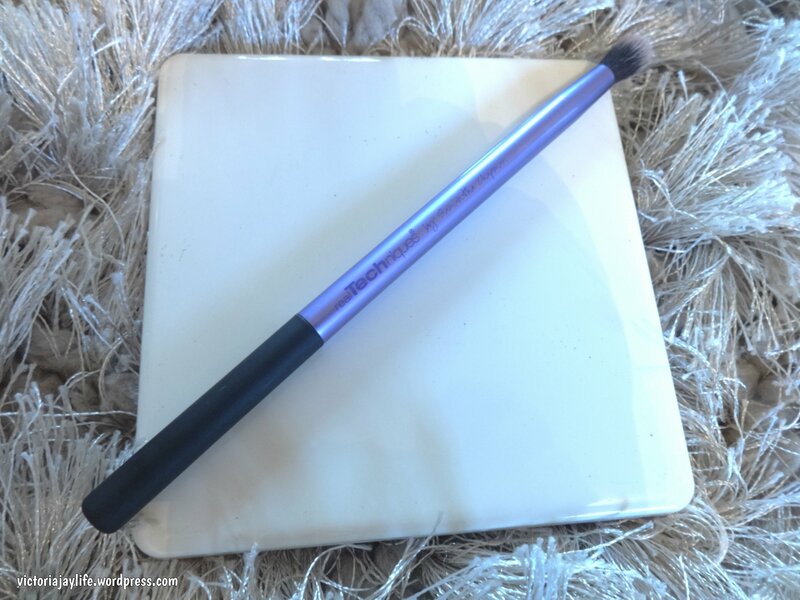 It’s just the right size to both apply and blend the eye shadow colour in the crease and has made a huge difference to how my eye shadow turns out. I don’t apply eye shadow without using this now. Again, it washes really well, retaining it’s shape and softness without shedding. A day doesn’t go by when I don’t use this (unless I’m having a make up free day!) I’ve never seen another brush with quite the same shape and dimensions so I think it’s pretty unique. I use this to set powder under the eyes or in other smaller areas such as around my nose. 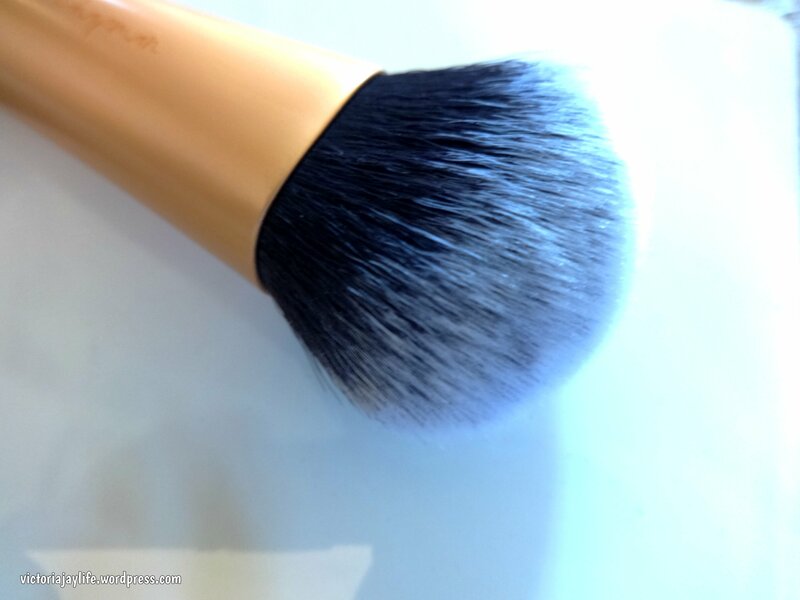 It’s also great for blending liquid concealer or applying powdered highlighter, and I’ve even been known to contour with it so it’s a definitely an all-rounder! It’s neither really dense or really sparse which lends it the multiple uses, and as with the other two brushes mentioned (and all other real techniques brushes I own) it has stood up to multiple washes. Do you have any Real Techniques recommendations? I’ve heard great things about the fan brush so that will probably be my next purchase from the range. I love a good night’s sleep (who doesn’t!) Years of shift work messed up my sleeping habits big time, and when I started a ‘9 to 5’ a few years ago, I struggled even more when I had to force my body back into a ‘normal’ sleep pattern. Now, I’m no scientist (unless being addicted to The Big Bang Theory counts! ), so these tips are just based on my own experience but with these in place I rarely have difficulty sleeping nowadays. I don’t mean a full on head to toe pamper session (but if you have the time and inclination to do this every night go for it!) but I find taking time over my skincare routine, using products I really enjoy, helps me wind down for the day. I start by literally washing the day off my face; micellar water, eye make up remover and cleanser. I follow this up with skin tonic, serum, facial oil, eye cream and night cream. I have a little acrylic storage unit on my bedside table and here is where I keep the products I use once I get into bed; cuticle cream, foot cream and hand cream. This mini pamper routine has become a bedtime ritual and I find it helps me physically and mentally relax ready for sleep. If you would like to know more about the skincare products I use please let me know in the comments – I can do a seperate blog post or You Tube video. In my opinion, your bedroom should be your sanctuary and by feeling completely and utterly relaxed by your surroundings, it can only help you sleep better. By invest, I don’t necessarily mean spending loads of money, it depends what you find comfortable and appealing. 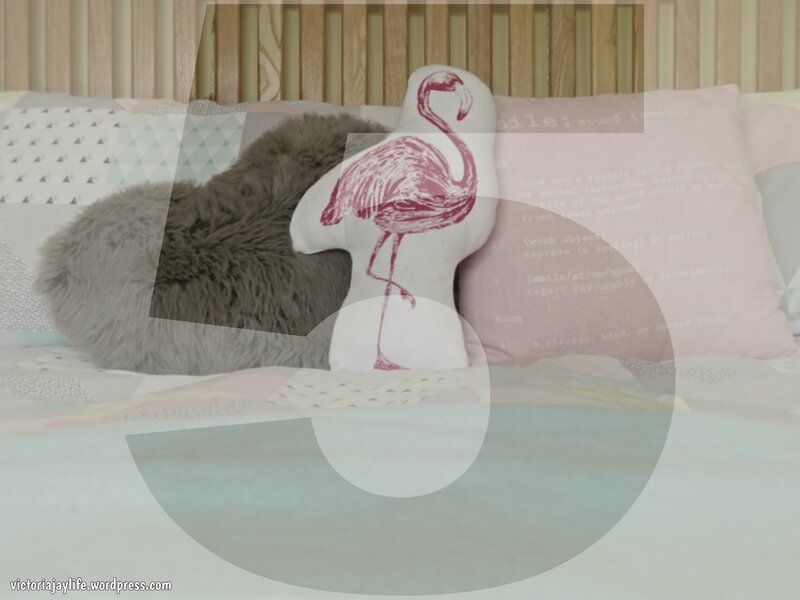 For me I want a soft mattress, calming colours and lots of ‘homely’ touches. For others it might mean a wall full of photos, or as many scatter cushions as humanly possible to fit on a bed, or very minimal decor – whatever floats your boat! This is one tip that I really should do more often! I’m vaguely aware of actual research with scientific reasoning as to why using smart phones or tablets before trying to sleep is detrimental (something to do with the blue back light I think – I’m sure Google will enlighten you if you want to know more!) and I’ve definitely noticed that if I don’t look at mine for an hour before going to bed, I get to sleep much quicker. In our household we even ban them for the whole evening on occasions and it really makes a difference. I’m a big believer in ‘de-briefing’ at the end of the day, no matter how mundane, stressful or exciting it may have been. Live with a partner or your family? Chat about your day over dinner. Live alone? Call a friend or family member each evening to talk about how your day was. Not really a talker? Why not write it down or keep a diary. I find just talking about my day, and listening to others talk about theirs, helps me ‘put the day to bed’ and clears my mind ready for a good night’s sleep. Meditation is a word that used to make me feel sceptical. And it’s because I didn’t understand it. I joined a Pilates class over a year ago, and the last five minutes is always meditation. For me, it’s about controlled deep breathing and clearing your mind (not necessarily chanting mantras or sitting in the lotus position like I had imagined!) I don’t do this every night but after a really stressful day, or when something is making me feel anxious, just doing controlled breathing as I’m trying to get to sleep helps me relax. I won’t try and explain how to do it, as I don’t want to give out any misinformation! However, there are plenty of You Tube channels available with methods and advice if you are interested. Lip products often end up in my shopping basket when I pop into Boots or Superdrug for ‘essentials’. This is probably because the colour on my lips is the most frequently changed part of my make up so I can’t resist experimenting when I see the latest launch or a promotion. Personally, I think you should wear whatever colour you want whatever the season, but there are definitely those products I find myself wearing more and more as the weather gets warmer. This range was launched last year and the colour unapologetic has been a firm favourite for me ever since. Coral is my favourite lip colour but I tend to shy away from it during the winter, favouring more vampy lips colours such as red and purple. But when the clouds start to clear and sun shows signs of shining, I go back to coral and this is definitely my most worn. It’s a bright coral, so one for lovers of a bold lip. 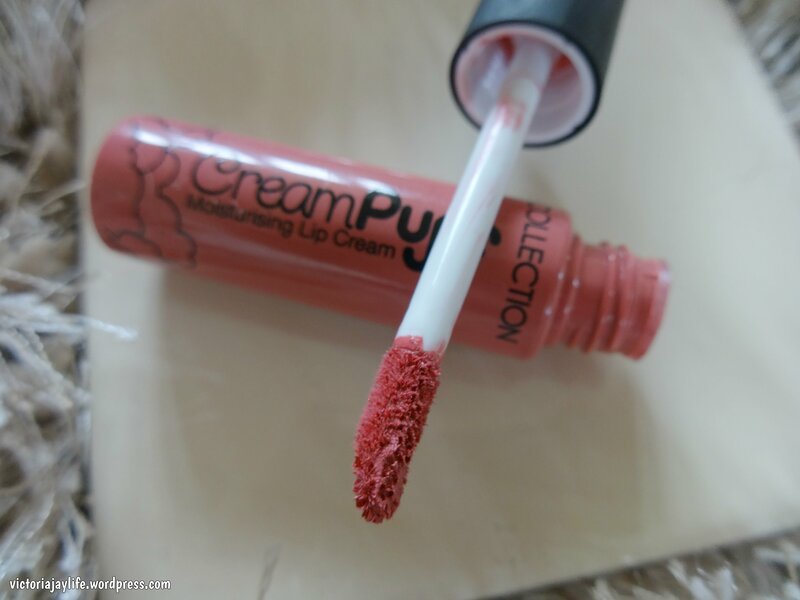 Despite being a matte finish and really long lasting, the formula is really nourishing (probably down to the ‘Triple Butter Complex’) so no dry lips with this one. It’s worth mentioning the product has a mint scent (and I think the whole range does) which I personally love but I’ve heard some people can find that off-putting. To see it on the lips click here. This is a more recent discovery for me when I tried out a few products from the brand (I posted a first impressions video on my You Tube channel) but I believe the range has been around for a while. The brand call these products lip creams on their website, and I think this is an accurate description. With a sweet scent as the name would suggest, it glides on really easily and feels ultra moisturising but dries to a matte finish. I’d describe the colour as a neutral pink, and think it’s perfect for day and night. 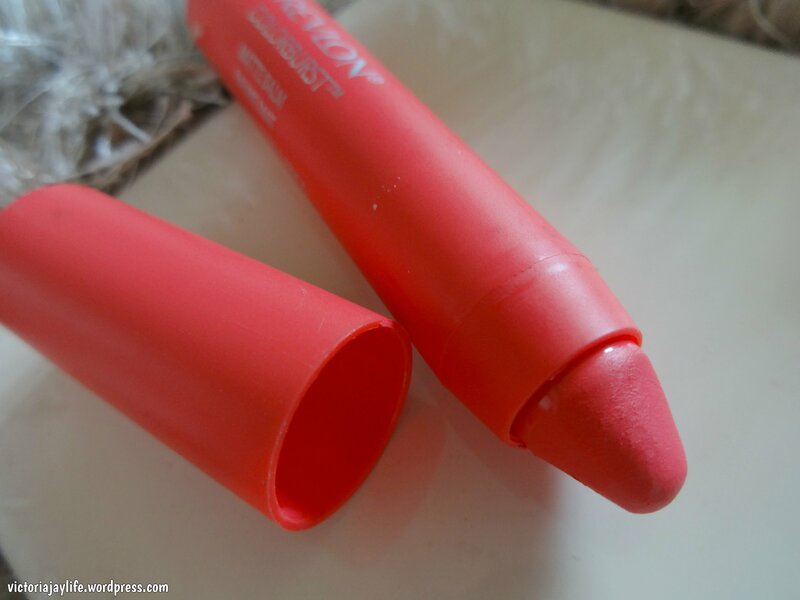 Not as long lasting as your classic matte lipsticks but much more moisturising, this has definitely earned it’s place on my favourites list despite not being in my collection for very long. To see it on the lips click here. If gloss is more your thing I can’t recommend this product highly enough. Tanya Burr released her make up range at the beginning of last year and I bought this one straight away. I have since added to my collection after loving this one so much, but exotic island is still my favourite. For a gloss, it’s highly pigmented. It’s also surprisingly ‘un-sticky’ and still has the usual gloss benefit of being easy to apply. 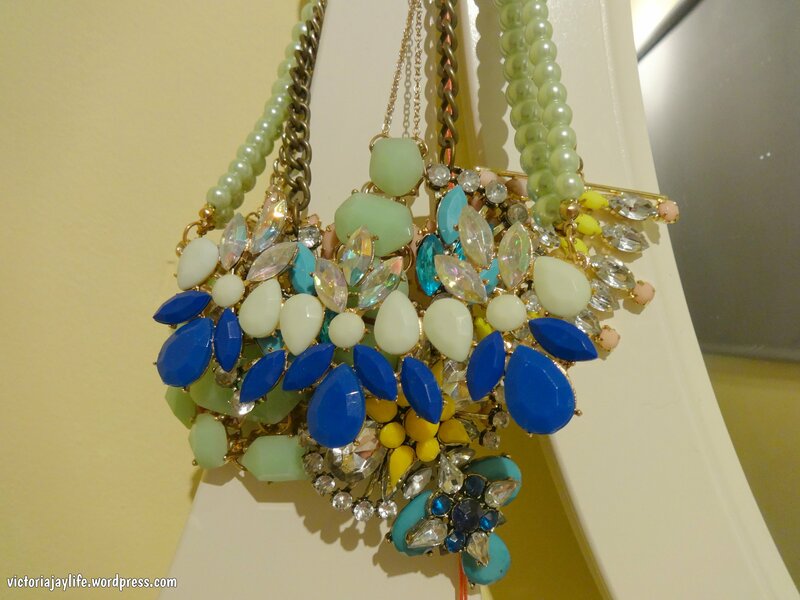 I love the vibrancy of the colour and find it brightens up any make up look. Oh, and it smells like sweets! To see it on the lips click here. 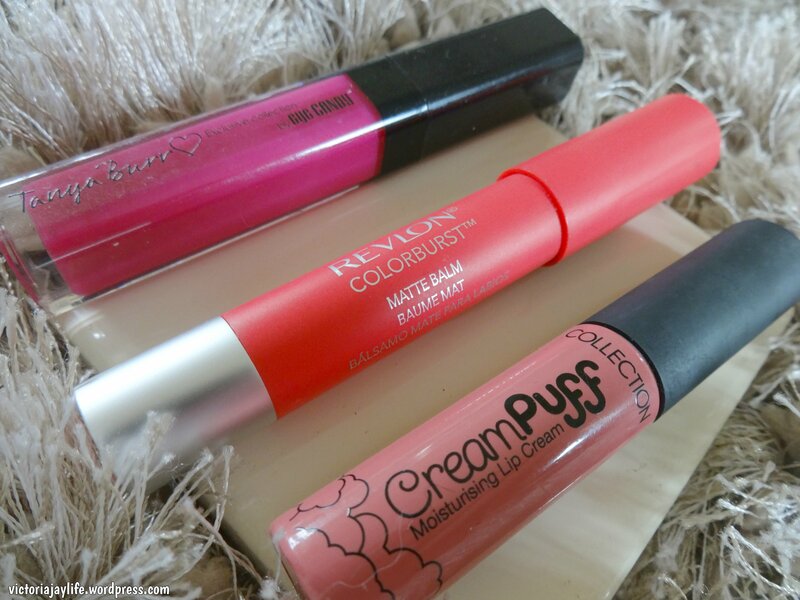 If you have any favourite bargain lip products, do let me know in the comments below!